We all have been hearing about the amazing world of 3D printing and the storm in the form of revolutionizing the manufacturing sector. This very concept will turn the current manufacturing process of machining, fabrication, casting and stamping a thing of past. So, what is it? Broadly speaking a process to manufacture 3D objects of any geometrical dimension by using digital model data derived from a 3D model. There are two aspects of 3D object printing. The first, all the data of the object to be printed in digital format and second, and a machine that reads the digital data and pours in layer after layer of the manufacturing materials to create the final product. Example: you have a tube of toothpaste and you start squeezing it while drawing different shapes. But in real life scenario the deposition of materials to form the final object is controlled by a computer’s 3D images and the digital dimensional data provided by it. The current process of manufacturing is a subtracting one and the new technology of 3D printing is additive one. If we have to make a pulley, today we cast it first and then using machining process slice away parts until you have the final product of the right dimensions. Something likes stone sculpting. You chisel out unwanted stone to get the final carving. 3D printing on the other hand is the exact reverse. You keep adding material in the exact proportion until you get the final shape as guided by a digital data feed. So, there is no material waste. There are quite a lot of that go into making a 3D printer. The important being the computer system that controls the movements to the exact nano dimension, the modelling and finishing. The official term used by the United States of America and the ISO technical standards committee is Additive Manufacturing (AM) to broadly define the process. Today this technology can be applied to almost anything. It is used in the making of Pizza, chocolates and other food items. It has been so fascinating that NASA has their eyes set on using this technology to print food in space. This technology has found its way into 3D printing of dresses, automobiles, aerospace and medical science with joint replacement and craniomaxillofacial reconstructions. Soon you would probably have a 3D printer at home that would be good enough to prepare you breakfast, lunch and dinner. That makes you thing if one day you could have a printer that could make a gun or a customized mobile phone for you. Well, that is a possibility. All we can say right now is that the process, standards and the laws governing them are in its infancy. With clear thinking and refinement everything would be put into place and we would have the right system in place. With worldwide interest generated in this new concept, funds are being poured into research and development to refine the process. Today we can have a 3D printer for around $1000 though a very basic printer device. Despite the increase of materials used and the higher speeds available for 3D printers, there is not much data available on the usable recycling materials. According to a 2017 report by CNBC, nine billion tons of plastic have been produced across the globe since the 1950’s. Approximately nine percent has been recycled. The concern is the additive manufacturing combined with the increased use of 3D printing will fill the landfills. The good news is recycled materials are the most commonly used filament type with the most minimal entry barrier. The optimization of print settings and PLA formulas has made recycled materials the best choice for the average project and creation of home goods for the last several years. The report is attempting to gather more information regarding any other materials. It should be noted PLA is more difficult to recycle because it is a biodegradable thermoplastic. The issue is a closed loop is used to test the sample. This may not provide an accurate representation. The polymer is slightly degraded due to the process of going from the printer to the tensile tester and returning to the printer. There was not much fluctuation in samples recycled numerous times using closed loop studies. The issue begins when plastic is included that has an unknown origin or has been degraded. PLA has more sensitivity to temperature and UV light than ABS. It is difficult to determine what mechanical properties would be established if the material were recycled because it has a better chance of degrading. The current knowledge regarding 3D printed materials is still limited despite the recycling platforms available. These platforms will assist in waste reduction when tested for fit, form or even knick-knacks. There were issues with recycled PLA in comparison to virgin PLA. The recycled material clogged the nozzle. A 3D printer was used to extrude the PLA into shear and tensile specimens. The materials were ground after testing, made into filament and printed again with a 3D printer. The mechanical properties prior to and after recycling remained very similar. The results for the recycled filament were more varied. The nozzle clogging caused by the recycled filament did not occur using the virgin filament. Despite the similar results, more testing for recycled 3D filament is necessary. The additional data is expected to reveal how to create better designs for recycled materials. PET or polyethylene terephthalate recycles well. After 2,000 cycles, the mechanical properties remained close to the published values for closed loop testing. The results were similar in open loop testing but it was impossible to determine the number of times recycling occurred. HDPE or high density polyethylene is subject to chain scission due to a cross linking of the chains and will degrade. The strength of the material is increased by cross linking. The impact strength showed variations in open loop tests, the material degraded and the impact strength varied. This shows the origins of the polymer must be understood. Recycled batches can be tested and produced and the material may stay in the published values when additives are used. Plastics may be cheap but this process costs money. When the additives and tests are included in the pricing it becomes difficult to remain competitive with virgin plastics. It may be possible to create a Filabot from bottles and print parts. Technology is advancing at a rapid pace. One of the latest advances concerns 3D printing. These printers can be found in living rooms, schools and university labs. Unfortunately, they discard little ends and plastic corners that are increasing the landfills. There are three students at a University in Canada who took exception to all this waste. They created a device called the ProtoCycler. The device was created to grind plastic waster into a plastic filament used by 3D printers. The device uses anything from plastic food take out containers to Legos. The concept is similar to a juicer but instead of strawberries this device juices plastic. The device is good for the environment while saving people money on filament for their 3D printers. These ingenious students have even created more color options than the spools available in stores. This proves yet again necessity is indeed the mother of invention. Research has established the growth of 3D printing is soaring due to the opportunities it offers. A Dutch company has launched their version with a sustainable and social design to help eliminate waste. They have created a filament actually made from waste. The project originated as Perpetual Plastic over five years ago. Plastic was turned into a substance similar to wire to be used for physical objects. A workshop was run at a local festival, beer cups were turned into amazing items and people enjoyed a sensational experience complete with memorabilia. The Dutch proved the experts were wrong and plastic could be turned into something usable. Filament is usually made from scratch. This company makes it from recycling plastic. Nearly ninety percent of all plastic is not recycled. The filament is made using car dashboards, portions of refrigerator doors and PET bottles. A company called Reflow purchases the plastic, gets it clean then cuts it up. These pieces become the filament used by 3D printers. The profits are being used to provide the waste collectors supplying the plastic with health insurance. This is a social cause that is working incredibly well. Even the United States Army is looking for ways to make PET filament from discarded plastic bottles. Soldiers serving the country in the battlefield will be able to use waste material to make spare parts from 3D printers. The discovery of how to use items such as yogurt containers and milk jugs to make the military more self-reliant, reduce demand for supplies and cut costs resulted from the collaboration of the US Marine Corps and the US Army Research Laboratory. This is a valuable source with extensive possibilities for applications. 3D printers can be used to produce medical implants and temporary parts for aircrafts. The advantages over standard manufacturing include a reduction in cost and time to produce parts. The filament is made using 100 percent recycled plastics and bottles with no additives or chemical modifications necessary. This enables FDM or fused deposition modeling for 3D printers. Once the issues of crystallization, moisture absorption and melting temperature are resolved, additional filaments and plastics can be used. The US Army believes using the waste most often found on battlefields will decrease the need to transport parts to the bases and reduce costs for waste disposal. 3D printing process is not a very complex process. In fact, all the different components and tools have already existed in the current manufacturing sector before. 3D printable models can be created using a CAD software bundle implementing a 3D scanner, or by a plain advanced camera and photogrammetry programming. 3D printed models made with CAD result in lessened mistakes and these can be corrected before printing and fine-tuned before it is ready for implementation. The manual displaying procedure of get ready geometric information for 3D PC illustrations is like plastic expressions, for example, chiseling. 3D checking is a procedure of gathering computerized information on the shape and appearance of a genuine protest, making an advanced model in view of it. Before printing a 3D show from a STL record, it should first be inspected for mistakes. Most CAD applications create mistakes in yield STL files gaps, confronts normal, self-convergences, clamor shells or complex errors. A stage in the STL era known as “repair” fixes such issues in the first model. Generally, STLs that have been delivered from a model acquired through 3D checking regularly have a greater amount of these errors. This is because of how 3D examining functions as it is frequently by indicate point obtaining, remaking will incorporate blunders in generally cases. Once finished, the STL document should be prepared by a bit of programming called a “slicer,” which changes over the model into a progression of thin layers and creates a G-code record containing guidelines custom-made to a particular kind of 3D printer (FDM printers). This G-code document can then be printed with 3D printing customer programming (which stacks the G-code, and uses it to teach the 3D printer amid the 3D printing process). Microelectronic gadget creation techniques can be utilized to play out the 3D printing of nano scale-size articles. Such printed items are regularly developed on a strong substrate, e.g. silicon wafer, to which they follow in the wake of printing as they are too little and delicate to be controlled post-development. In one procedure, 3D nanostructures can be printed by physically moving a dynamic stencil veil amid the material testimony prepare, fairly practically equivalent to the expulsion technique for conventional 3D printers. Programmable-tallness nanostructures with resolutions as little as 10 nm have been created in this mould, by metallic physical vapor affidavit mechanical piezo-actuator controlled stencil veil having a processed nano pore in a silicon nitride layer. The whole technology and the concepts have given birth to different process in the world of 3D printing. The following are some of the processes to name a few. With the world-wide interest shown in the process and funds being poured in to research and development for the refinement of the whole technology, we are soon to witness new horizons being conquered in the very new future. When the typewriter was introduced in 1868, it was to people what virtual reality is to us now. It was something people had never seen before, a new idea that added value and made things a little more perfect. The typewriter created perfect typography, but one mistake meant the paper had to be re-written. The same is true today as more and more people learn how to use 3D printing and rapid prototyping. One over-looked mistake in the design of a piece can be fatal to a budget or to the project itself. For that reason, in this article we will discuss the implications and differences between open-source low-cost 3D printers, and commercial rapid prototyping machines. Open-Source is the term given to software that is free to use and be edited by people other than the creator. This made a shift in the way that creators and 3D enthusiasts create objects. Imagine if the software was not open-sourced, what would happen? People would have to create and design their own 3D objects from scratch which would have made the industry grow at a much slower pace. By making it an open-source concept, people can simply look for designs they like on websites like TurboSquid and download them to print on their 3D printers. The difference between these low-cost open-source models is that they’re often free and not protected by patents or trademarks. This is one of the major differences between commercial RP machines and low-cost 3D printers. We gave you an example of an open-source website where people can simply download the designs they want, and they can further edit it to fit their individual styles. When using rapid prototyping machines or companies that will do it for you, the designs and processes are not open-sourced and so one must abide by their rules and regulations. Because of this same reason, using rapid prototyping will cost a lot more. Precision: These machines have been perfected for much longer than low-cost 3D printers, hence why they are so precise in the final product. Materials: Commercial RP Machines have the ability to use a wide range of materials such as metals, powder, and even cement. This allows a large degree of freedom on the products they can create. Size: Some commercial RP Machines can fit a human inside of them, whilst the biggest 3D printer is only a couple of feet high. IP: Intellectual property is what keeps Nike and other top brands at the top. They protect their designs and ways of producing products, to that one can tell right away when a fake Nike product is produced. It’s the same with these commercial rapid prototyping companies. Low-Cost 3D Printers: Here’s another resource if you are looking to purchase a low-cost 3D printer. It is TechRadar’s list of the best 3D printers to use in 2018. Prices range from $206 to $4,000 and can be found anywhere on Amazon, e-bay or directly from the 3D company’s site. Commercial RP Machines: On that note, low-cost 3D printers will cost no more than $4,000, but commercial RP and 3D printing machines start at around $6,000 and can go up to $750,000 depending on the size they can render, what materials they use, and the precision of the final product. We have summarized the differences between low-cost open-source 3D printers, and commercial rapid production machines. We provided resources to websites like TurboSquid, an open-source 3D printing object design company dedicating to sharing 3D designs with the world. We have also shared places where you can purchase low-cost 3D printers that start at $200 and go up to $4,000 with an emphasis and contrast to commercial rapid production machines which start at $6,000 and can go up to $750,000. A multi-billion dollar industry was born at the turn of the 21st century when the process of 3D printing was introduced in the 1980s. In the past thirty eight years, a lot of changes have been done to the industry, allowing buyercs to purchase their own 3D printers for less than a laptop. It is estimated that by the year 2019 this industry will be worth more than 20 Billion dollars. We estimate it will be worth more if certain industries, like the medical and housing, put these printers to use for mass production. Though there are hundreds of ways in which the 3D printing technologies can be used, we’ve narrowed it down to some of the favorite applications. This article is focused on describing those applications, and is open to interpretation for you to do further research. These applications are not in order of importance, because they are all fascinating in their own ways. We’ve chosen to discuss food items, innovation and a faster and inexpensive way to prototype, prosthetic components and body parts, houses and architecture, and tissue engineering (organ printing). Food printing has already happened. 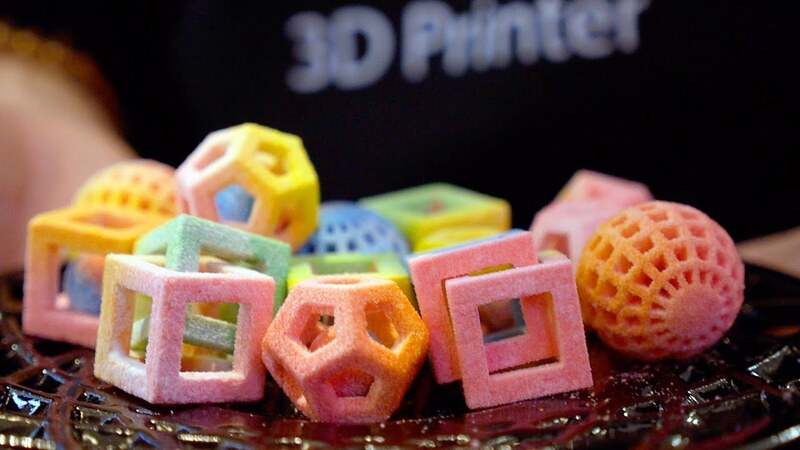 At the CES convention we witnessed the first 3D printed chocolates, candies, and other cakes. The machines are so precise, that they can print intricate designs perfectly, such as these. One of the main reasons why 3D printers were created, was to allow entrepreneurs and hobbyists to quickly get ideas off their minds and into reality. 3D printers allow people to do just that, by designing, uploading, and printing their ideas on the spot. The medical industry will see a tremendous increase in its availability of prosthetic parts, and this increase will allow prices to become more affordable. We often see photos of children, and adults in third world countries missing a leg, arm, or other body parts. It would be great if these costs were able to come down, due to the availability and ease of printing them with inexpensive, but durable materials. In a previous article, we discussed how Winsun, a Chinese construction company is printing houses in twenty four hours. If they had the money and resources to do this non-stop for a year, they would be able to literally print, 8,760 houses in one year. This would create a lot of revenue for electric and water companies, and would help solve the issue of homelessness. Printing organs sounds like something out of a movie, but that’s because it is. We often create movies as a reflection of our futures, and printing organs is arriving faster than we imagined. In conclusion we have provided our favorite 3D printing applications. Hopefully you will do further research to understand why 3D printing is such a revolution. There comes a time in humanity’s time-line, when a dent is created in the universe. This dent, allows us to live in excitement and curiosity of what the future will hold. In this time of our life, we can now use rapid prototyping in the medical field. There have been plenty of movies showcasing a human with robotic parts, a cyborg. With rapid prototyping coming into the medical field, we are getting closer to the day when we are half human and half robot. In this article, we will discuss the ways in which rapid prototyping is revolutionizing the medical industry. In the past, prosthetic and implants were provided to patients with a standard measurement scale. We know that one size does not fit all, and though some people may have a similar body-type and can wear the same length of jeans or size of shirt, it is completely different when it comes to a body part. Rapid prototyping has changed this and can now provide a very accurate measurement of a prosthetic product by taking x-rays of the patient and converting them into a file which the RP machine can read. It then analyzes the best type of material to create a hand, leg, or any other type of prosthetic in order to get as close to the real thing as possible. Combining rapid prototyping with advances in the neuroscience sector, doctors and scientists are now able to give prosthetics which can be controlled by the mind. This is the dent spoken of earlier in the introduction. The scientific term for rapid prototyping of organs is tissue engineering, but in this article it will be called organ printing. Printing organs is a very recent discovery. The best use for these printed organs is in the transplant process for patients in need of a heart, or any other organ. Because it is a subject that has not yet been mastered, there’s a lot of research being done to perfect the method. Currently, heart valves, liver structures, kidneys, and other hollow structures have been printed for testing. Certain hollow structures such as veins, bladders, and tubes for urinating have already been implemented in clinical trials. The way in which these tissues have been printed is by using inkjet printers which have been modified to be able to “print” with gel and living cells, instead of ink. Once the gel and cells are printed in the form of the organ or hollow structure, the cells begin to fuse and create a living tissue. Rapid prototyping is an amazing area of research which will revolutionize, and is already shifting the medical industry towards a futuristic society. In the past, people did not live beyond the age of forty due to poor medical procedures, infections, and lack of anesthesia. With our current medical research, the average lifespan is seventy to eighty years old, and more and more people have lived past the hundred year mark. Rapid prototyping is the next leap in our evolution and if done correctly, will allow humanity to surpass the limits of death. Imagine being able to print new organs, new skin, new tissues, new blood cells, every time we need them. When this is achieved, humans may become immortal. For now, it is an area needing lots of research, but also one that is moving very very quickly. Soon, we will be able to print complete, operating organs for all ages, and we may even be able to print our own medicine prescriptions by going online and selecting the sickness and the cure. We are far from being able to do all this, but the millennial generation may be the one to see all of these creations and live forever without any more sickness. In the forefront of recent cool technological advances, 3D printing has to be at the top of the list. The average person now had the ability to print just about anything, providing they have a 3D model. With a 3D scan and a 3D printer, you can literally reproduce anything, from a piece of jewelry to a building. Scanning cameras can also be used as a platform for developing totally new creations. For a frame of reference, think about Photoshop and how using a photo, you could modify an image in a variety of different ways. 3D scanning cameras give you the same capabilities, but with objects. Making a 3D model involves a camera and software. Many different types of cameras can be used from GoPros to videos and smartphone but DSLR cameras work best. First, the object must be still, not too big, small or shiny. There needs to be lots of surface details and not too many areas that are uniform and have no definable features. Thin, delicate parts might also cause some problems. Place the object on an easy to shoot platform with good lighting, such as a stool. Next, get ready to take about 100 photographs remembering that the better the photos, the better the scan. The photographs of the object need to be from every angle and every side. It is best to overlap the photos to best capture its 3D shape. The object of each picture should be to overlap from the previous photo. The software does not care about excess photos or overlapping, or even order of photos for that matter. It cannot create from material it does not have so it is better to take too many pictures than too few. The software you are using to create 3D scans from your camera should instruct you on how to set up the camera for the best shots. Taking better quality photos means better quality scans. Remember that taking photos from different angles will alter the background of the photos. Pick a multitude of angles to be sure to get the best exposure of the object. It is best to monitor the photos as you take them to be aware of how the background changes, and make sure the effect is not too dramatic. Also, keep an eye on the exposure of the shots as overexposure is better than underexposure. Once the object is photographed from a variety of angles, it’s time to pick your scanning software. There are many choices available including free software such as Autodesk and Memerito. Both are easy to use. Other options that are higher in quality but take up a lot of RAM and are a bit more difficult to use are Autodesk’s 123D Catch and Agisoft Photoscan. After choosing the software, it is time to process your images. This will include mesh and color mapping. “Shapespeare” offers useful tips on how to process and 3D print just about anything. Injection molds can be produced faster and at lower costs using additive technologies rather than subtractive technology. In addition, additively produced tools can be used to indicate the performance of a final hardened tool. The use of additively-fabricated molds can create plastic components by the dozens, and in some cases, the millions, to be used for prototypes or testing. Methods are slow and expensive. Skilled workers for these methods are in short supply. Product complexity is high, product cycles are short. More precise tools are needed from declining supply of toolmakers. The benefits of the process of additive technology in injection molds include saving time and labor. In addition, additive technologies can provide the option of improving mold performance that supersedes subtractive technologies. It provides the ability to build conformal cooling channels which assist with increased thermal performance. It also allows for the use of multiple or gradient materials which optimizes the performance of molds. These benefits decrease cost and may be a revolutionary development in the field by decreasing cycle times by 20 to 30 %. When Should Additive Technology Be Used? Additive technology may never be able to replace subtractive methods, even though progress has been made to increase labor, time, precision and durability. The benefits should be evaluated on a case by case basis and should be considered for the following types of projects: when reduction production to market time is vital, for short to medium productions and prototypes, and for molds that are difficult to machine due to geometry. While additive methods as compare to CNC do have its advantages, the limitations should also be considered. The tools produced by additive methods can be less accurate and less durable. Some parts may be prone to geometry and size limitations. The parts produced may not be identical to final hardened tooling. Additionally, the tools produced utilizing additive methods may not be modified easy or corrected using the traditional tool making methods. There are variations of these limitations based on each individual case and for the specific additive technology utilized. Tool fabrication by additive technology is a one-shot deal due to the fact that tools produced by this method cannot be modified. This is a disadvantage compared to conventional tooling that allows for modifications during the tooling process. There are many complex factors in considering selecting the additive process such as: final application, part size, production volume, material requirements and the need for accuracy. It is important to keep in mind that while direct tool production may be faster, the indirect process can be lower in cost and produce more accuracy. In certain cases, it may be inappropriate to produce one part of a tool with CNC technology and the other part with additive methods. Consideration should be given for economy and an appropriate process for each component of a tool rather than for the tool in its entirety.